This episode is a collaboration between five podcasts. Check out the other podcasts listed at the end of this post to hear their take on building community. Redhead on Broadway: two parts bourbon to one part sweet vermouth and top with ginger beer. It's Erica's softened version of a Manhattan. Building community or "Nobody doesn't like a friendly neighbor"
We chat about what having community looks like for us, what we'd like to improve about our current communities, how motherhood has changed our perspectives, and how to build community without creating a bubble around yourself. Erica also shared: "Organized fun...I just have a hard time with." Erica is obsessing over her new thick and soft makeup brush. Kelsey is obsessed with getting a fall feeling by browsing her fall Pinterest board. 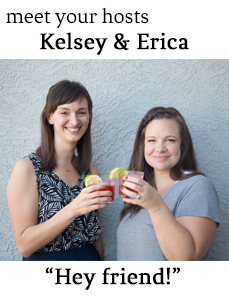 Cohesive Home / Melissa and Kate, two laid-back moms, explore the topics you most want to hear about-- family minimalism, adventuring with your kids, living by your values, and more-- all in the time it takes you to brew your morning coffee. Sometimes ridiculous, always on point, the Cohesive Home podcast puts the fun back in parenting and creating your happier, simpler home.